Mount Goode, from near Long Lake. 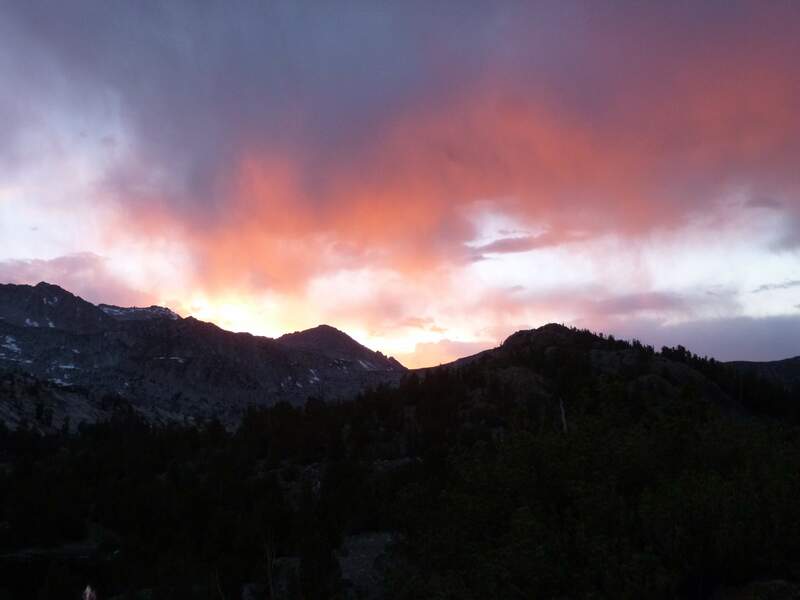 Keen to enjoy some hiking and camping in California’s Sierra Nevada, our trip began at the White Mountain Ranger Station in the town of Bishop, where my friend Don and I stopped to pick up our overnight permits and rent a bear canister. 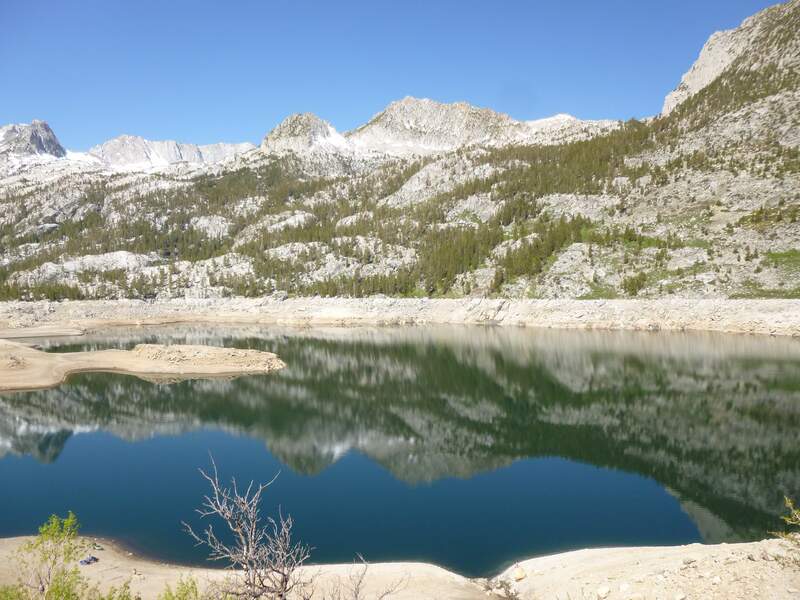 The rangers in Bishop told us that the trail was in great condition, with all of the lakes at least partially thawed. 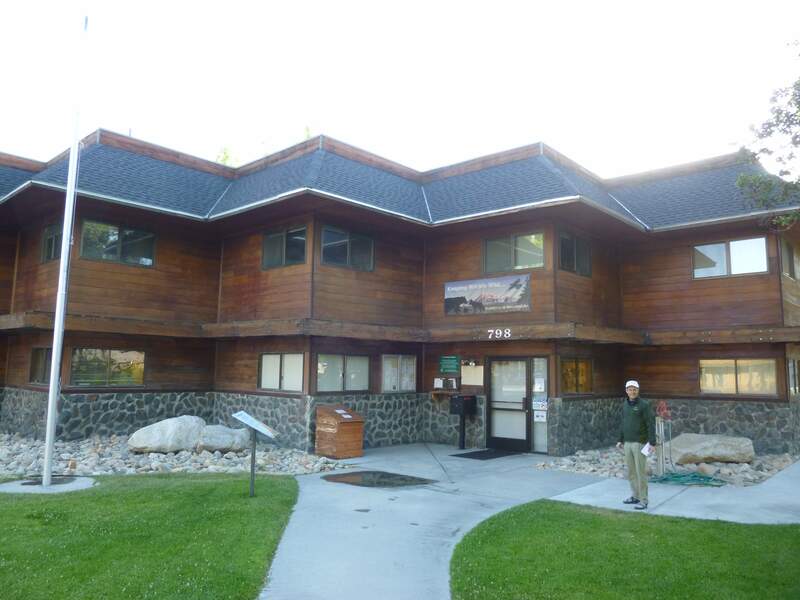 The White Mountain Ranger Station in Bishop. 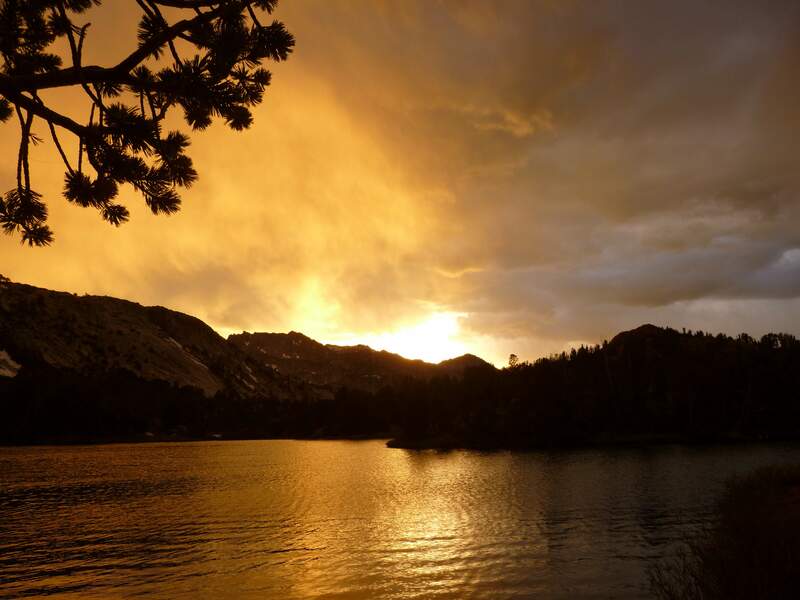 Having already acquired a map at the REI in Sacramento, and with the promise of good early summer weather, we left the ranger station promptly and began driving to the South Lake trailhead. 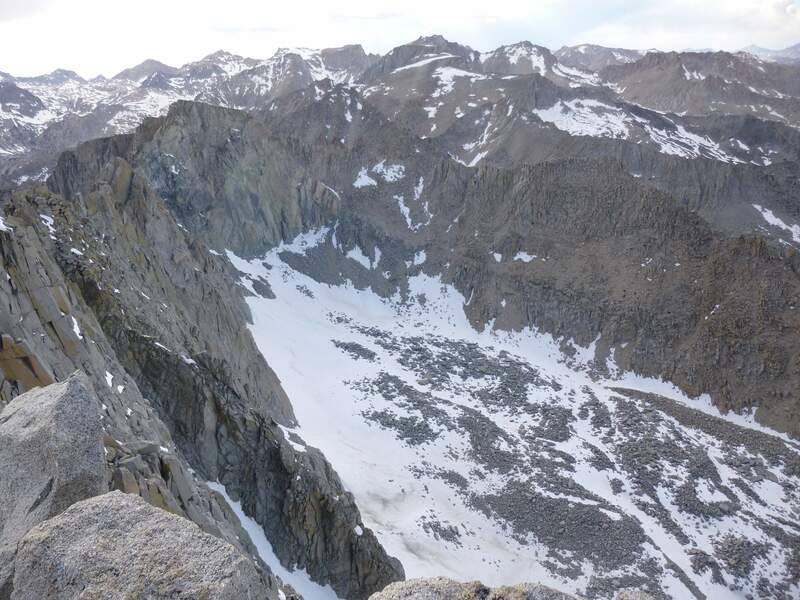 We had a rough plan to try and hike two or three 13,000 foot peaks in the Bishop Pass area, but ended up just hiking one, 13085 foot / 3988 meter Mount Goode. 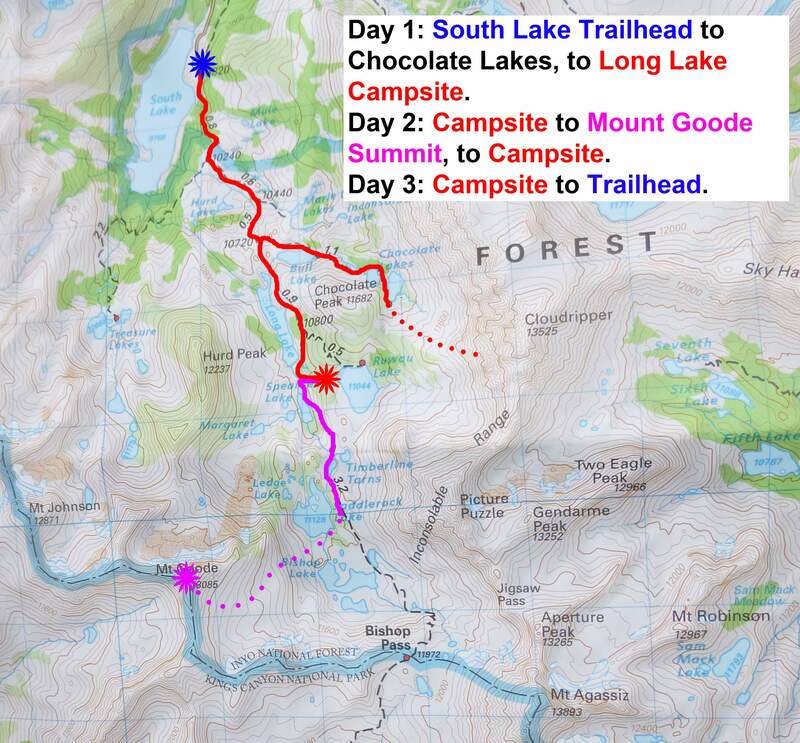 A map of our three day hiking trip. Day 1: On arrival at the South Lake trailhead a short drive later, we were greeted with distant views of Hurd Peak, the first of many impressive granite mountains on our route. 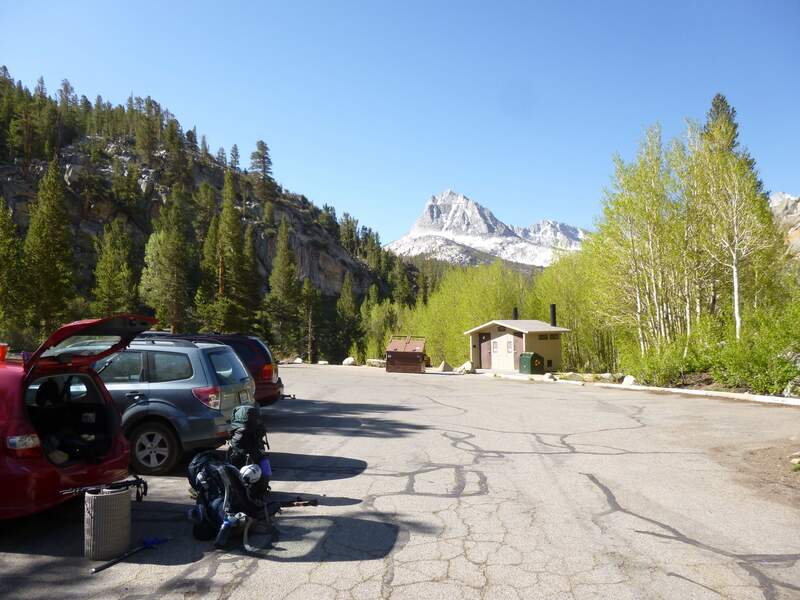 The South Lake parking lot, Hurd Peak in the distance. 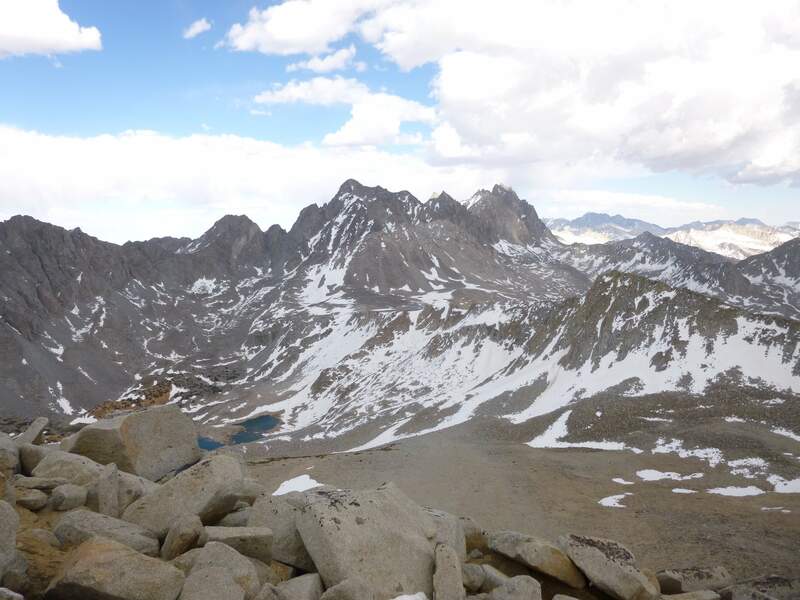 After getting our bags ready and bear-boxing spare food, we began heading down the trail towards Bishop Pass. 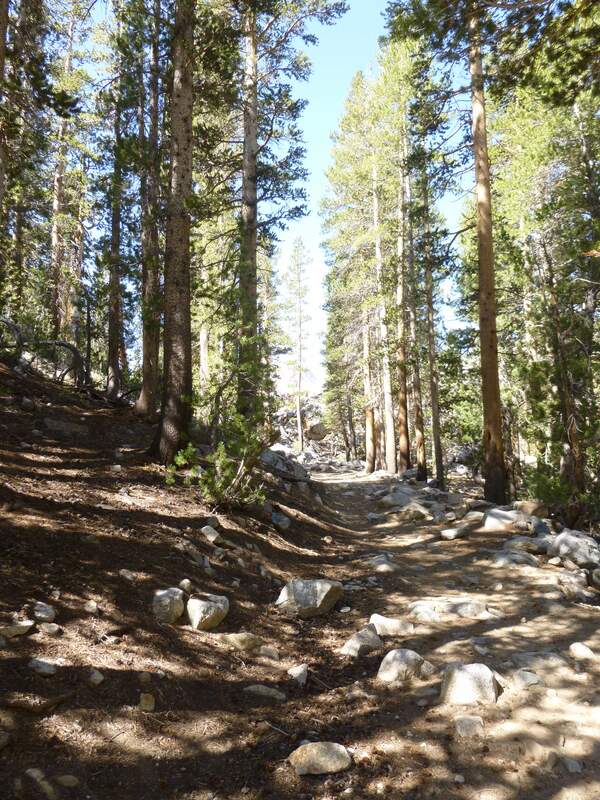 The trail is well maintained and easy to follow, with signposts marking the way. Near the trailhead we encountered a few people out fishing for the day, looking relaxed in the lovely weather and fantastic scenery. Past South Lake the trail moved through forest. Once above the trees the views were fantastic, and we couldn’t help but take our time stopping for photographs and enjoying the weather. On the the Bishop Pass trail. Hurd Peak in the background. 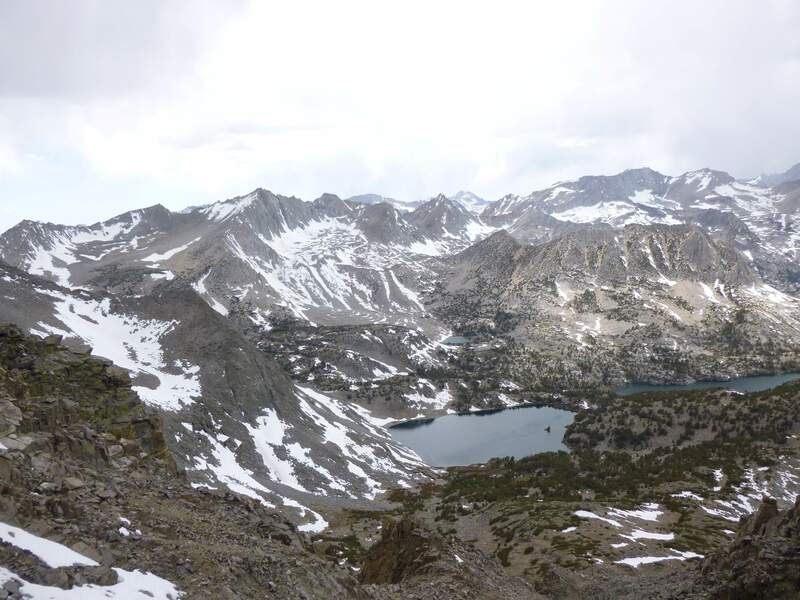 We reached a fork in the path, splitting east to Chocolate Lakes and south to Bishop Pass. We decided to stash our camping gear, switch to light packs, and head in towards Chocolate Lakes. To the east waited 13525 foot Cloudripper, one of the peaks we intended to take a shot at. 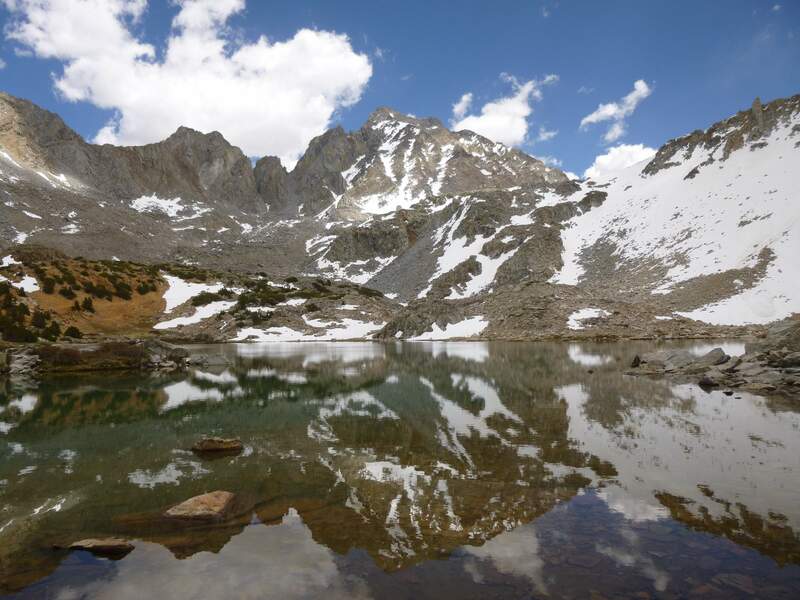 In front of us, appropriately named Chocolate Peak reflected off of Bull Lake below it. Chocolate Peak and Bull Lake. Further in, Cloudripper stood above us. 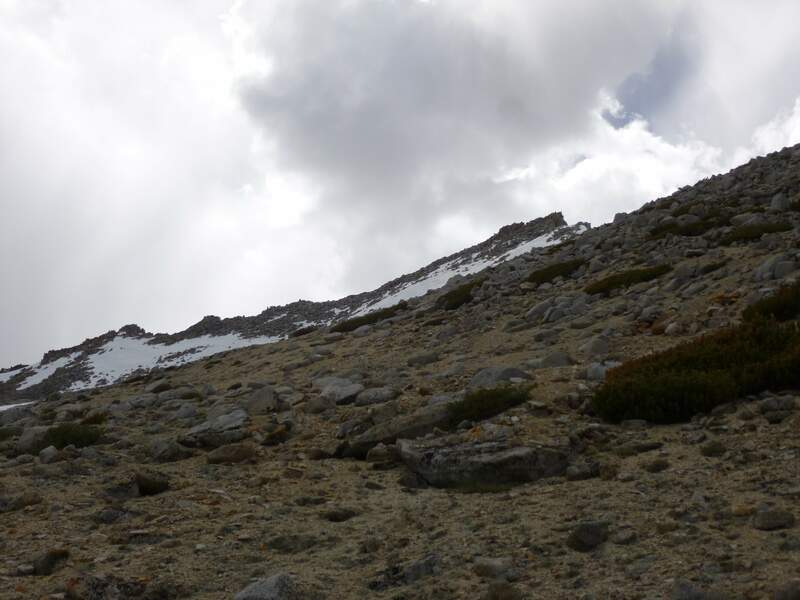 We could not make out the straightforward hiking/scrambling route which our guidebook described, so we chose to try ascending near the wide scree slope located just to the right of the peak in the below picture, with no idea whether or not it would offer us a way up. 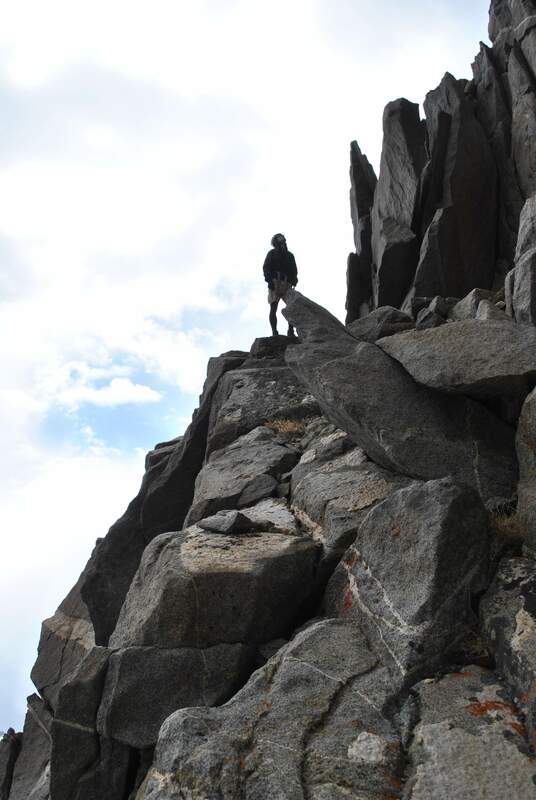 We began climbing over the big rocks and talus beside the scree slope, enjoying the scrambling upwards. Soon we were above Chocolate Peak, and had some great views of nearby lakes and mountains. Looking down on Chocolate Peak. As we climbed higher route finding became more involved. Equipped with only our hiking poles, we stuck to moderately sloped scrambling as much as possible. Hiking up the rock and talus on Cloudripper. 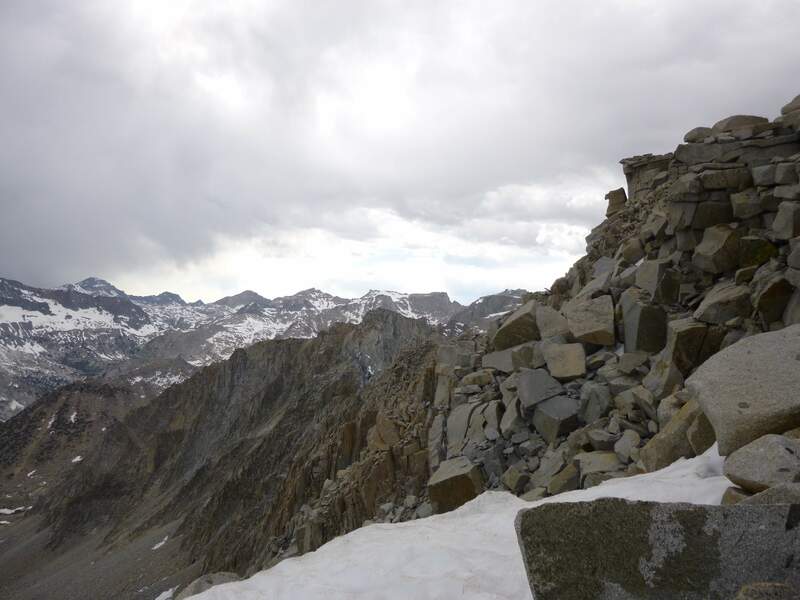 Soon we were above the talus and scree and found ourselves faced with big granite slabs. Climbing past two fairly straightforward but hazardously exposed pitches it became evident that the terrain above only became more difficult and dangerous. We realized that the route we had chosen would probably not yield us an accessible way up. 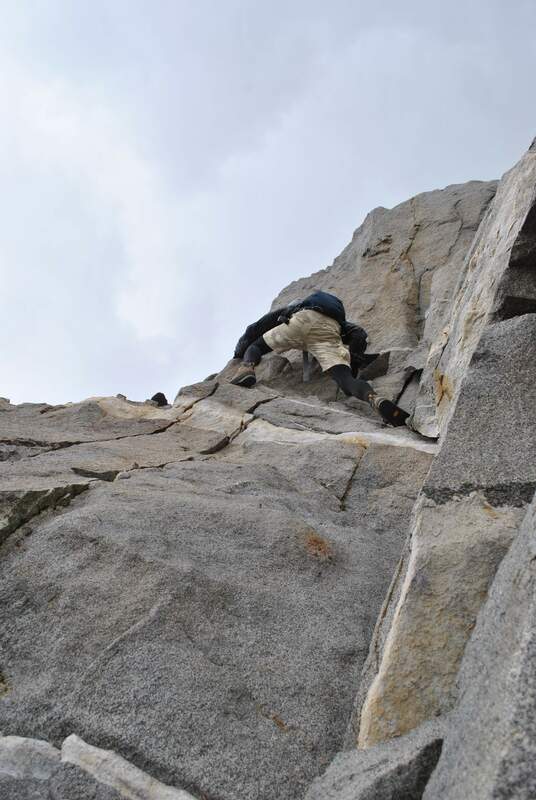 The scrambling transitioned into exposed climbing. 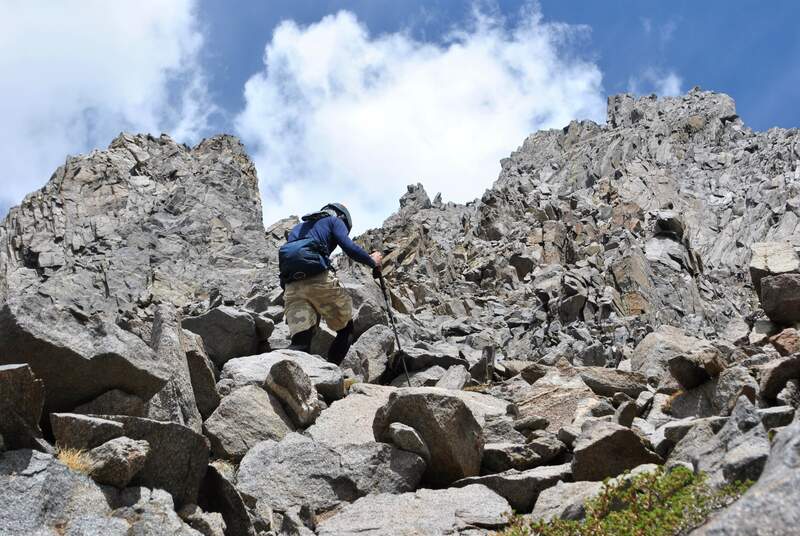 Faced with considerable exposure to serious fall on nearly vertical rock, equipped with no rope, and knowing we would have to down-climb any further progress to return to our bags, we decided to descend. Trying to find a route up. As we turned around a light snow began. We felt disappointed, but grounded in the reality that we were unprepared to safely continue. Later we found pictures better illustrating the standard route up the west side of Cloudripper, which follows a chute to the left of the peak – next time! As consolation we enjoyed great views of the whole area below us, including the north and east slopes of the next day’s objective, Mount Goode. Looking down from high on Cloudripper, Mount Goode is the highest peak in the top left corner. 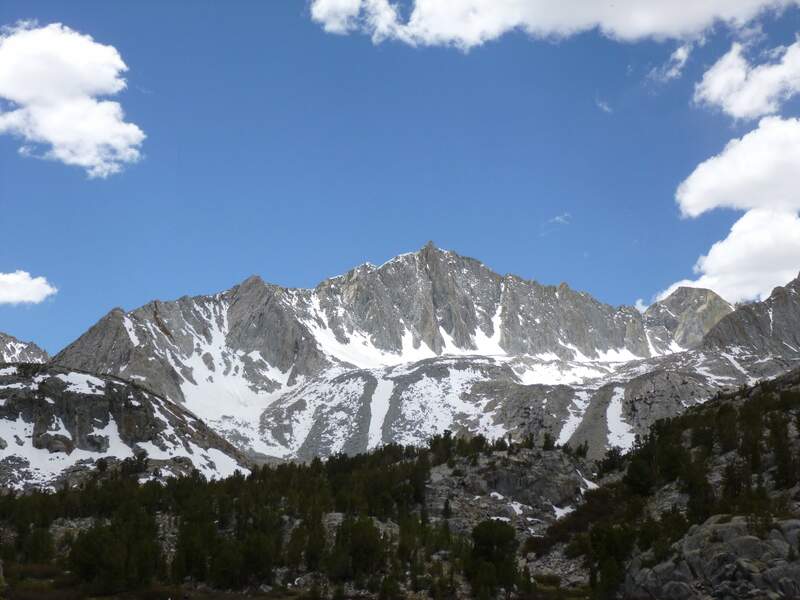 Mount Goode’s south-east slope, used for hiking ascent, is to the left of the peak. Once off of Cloudripper we slowed down to enjoy the easy hike back through the Chocolate lakes area, reuniting with our heavy overnight packs and continuing south towards Long Lake. 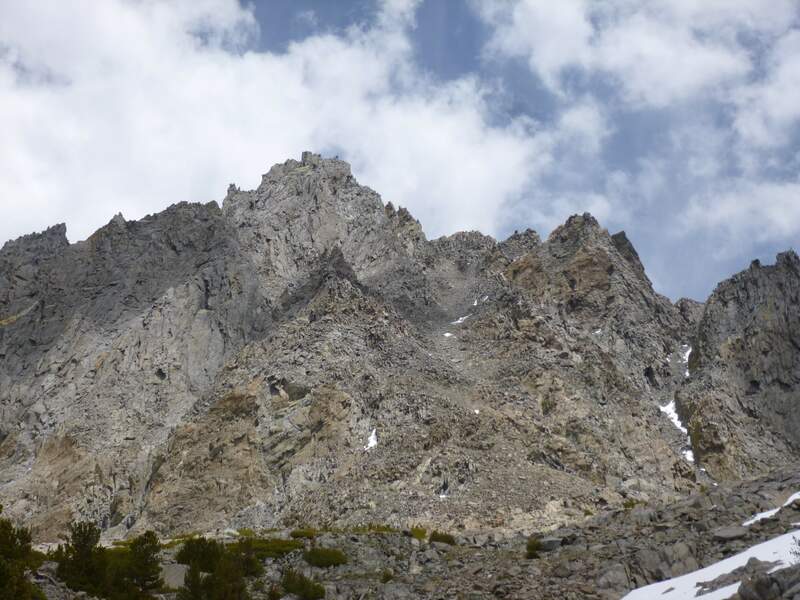 Soon Mount Goode stood in front of us, a commanding, aesthetically pleasing fortress of granite. Mount Goode in the distance. Slightly south of Long Lake we turned off of the trail and pitched camp in a sheltered, quiet little area at the top of a small hill. Our campsite near Long Lake. We enjoyed a fiery sunset as we cooked dinner and drank Californian IPA beer. 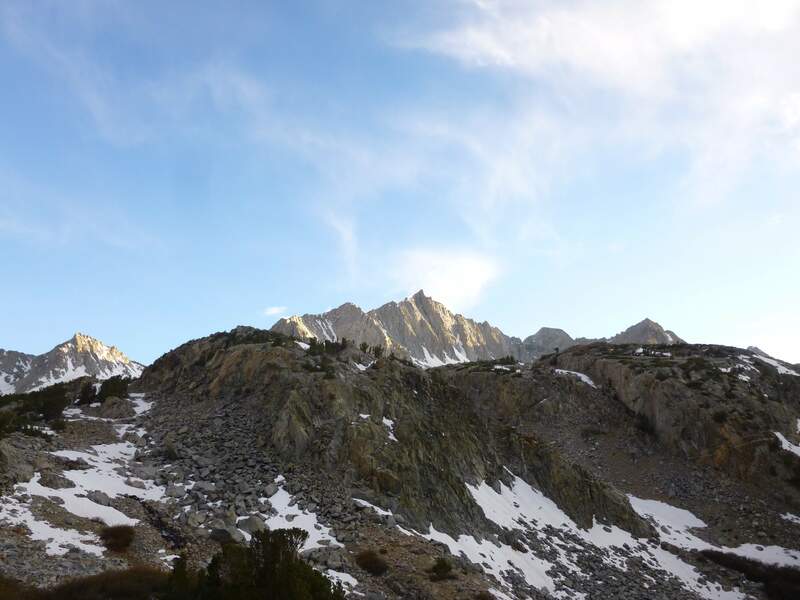 Day 2: Up before the sun, we began hiking south towards Bishop Pass, and the southeast slope of Mount Goode. 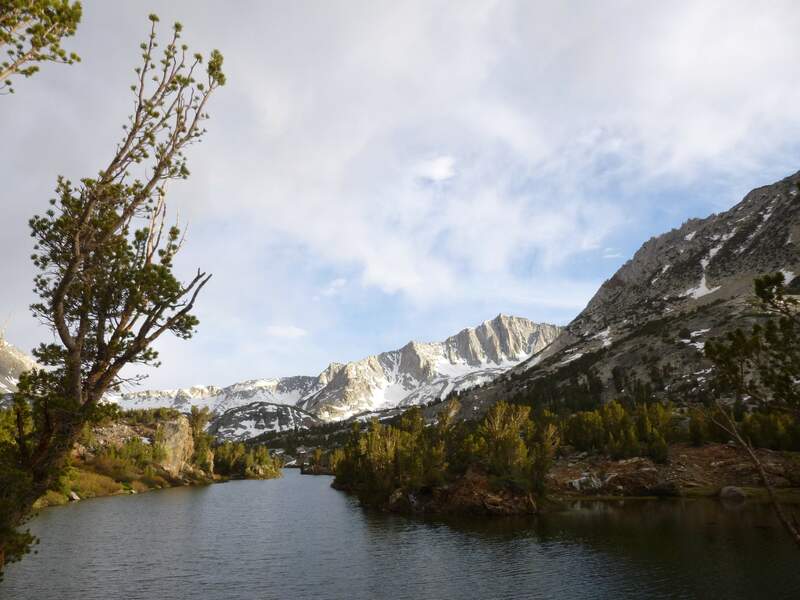 Once we reached Saddlerock Lake we cut west, off of the trail and overland between Saddlerock Lake and Bishop Lake. The terrain here was pretty, with lots of rolling granite, shrubs, and snow banks. Looking up Mount Goode’s southeast slope. 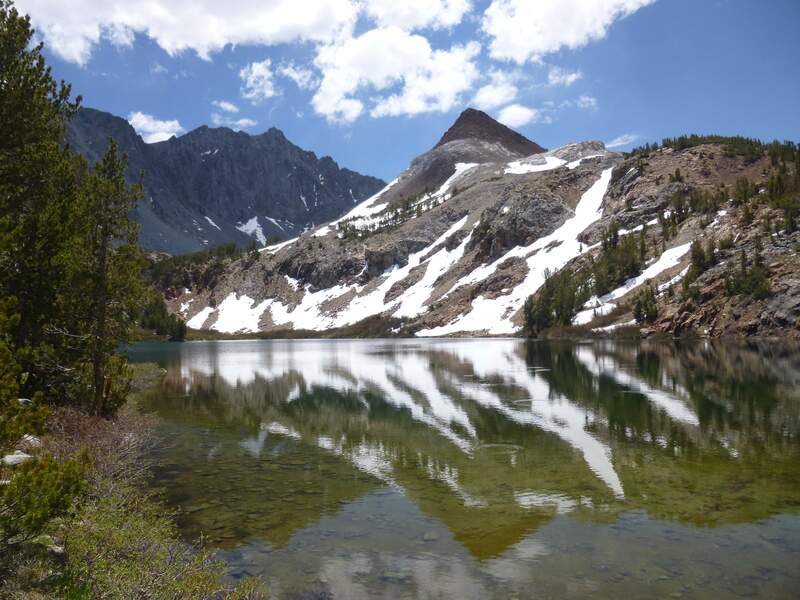 To the southwest, Mount Aggassiz stood mirrored by Bishop Lake below it. 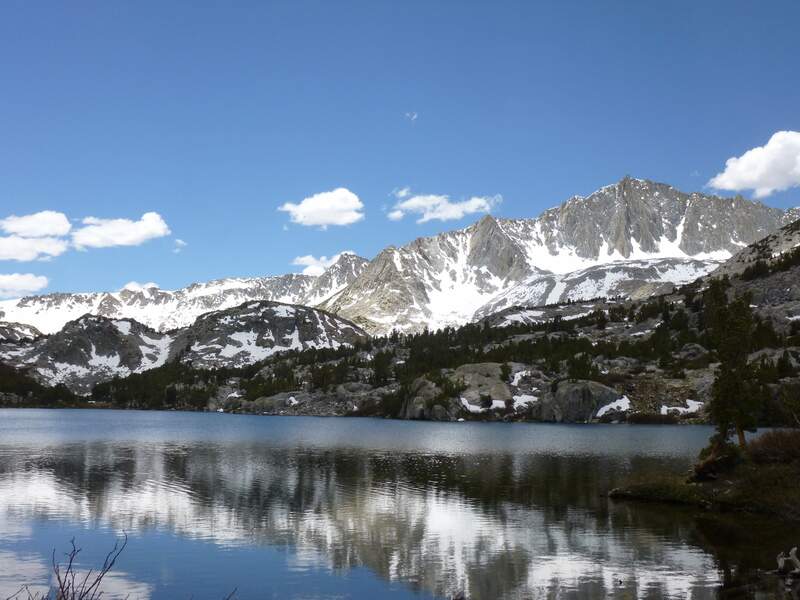 Mount Agassiz and Bishop Lake. 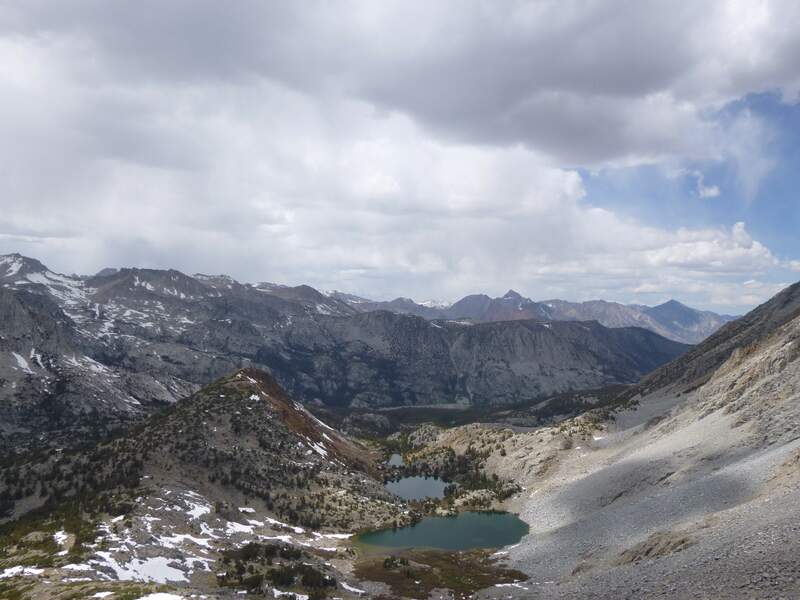 Looking back at Saddlerock Lake and Bishop Lake from the southeast slope. 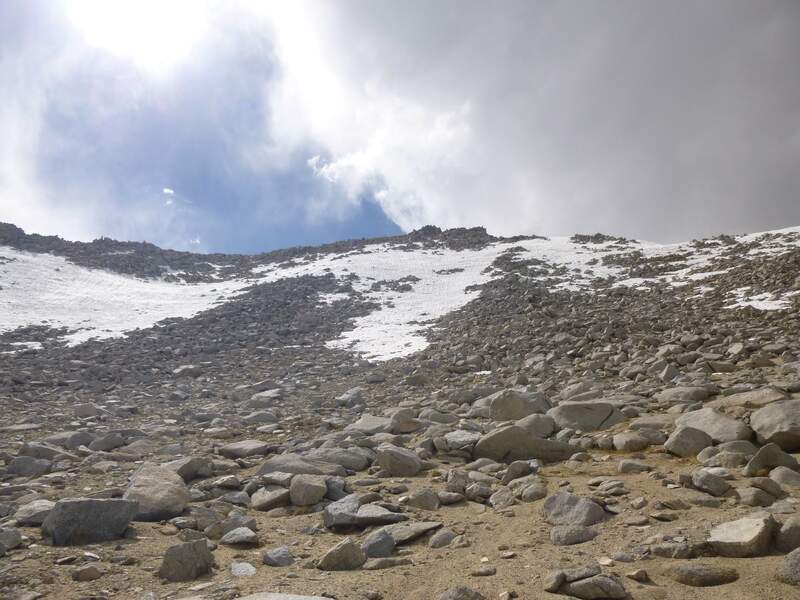 Initially the route took us over rock and brush, but soon changed to sand and scree. Not too bothersome due to the gentle angle, we were soon through the worst of the sand and moving over big rocks. Looking up the southeast slope, almost above the sand. We chose a direct route straight up over the rocks and enjoyed some scrambling as we reached the top, where we were met with a sharp drop off down Goode’s north face. 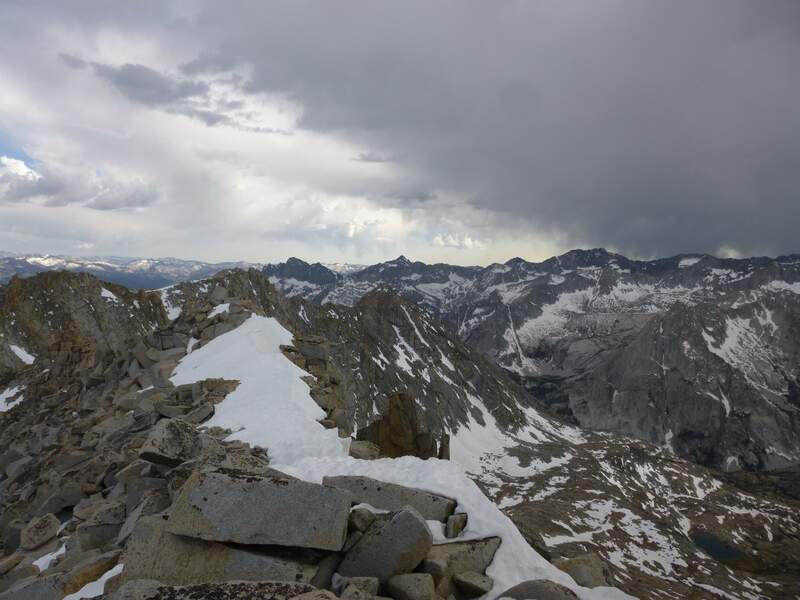 We were west of the summit, and could see the highpoint jutting out from the ridge. Looking east along Mount Goode’s north face, the summit ahead of us. West of the summit, looking west. Looking East, towards Mount Agassiz and Thunderbolt Peak (right). Bishop Pass is below Mount Agassiz. We climbed east, moving along the edge, passing over snow and big rocks to what appeared to be the very top, where we stopped to snap some photographs and take in the views. This area was surprisingly large and flat. This was unexpected, as viewing the mountain from the north we had earlier marveled at the narrow, jutting apex of the north buttress. 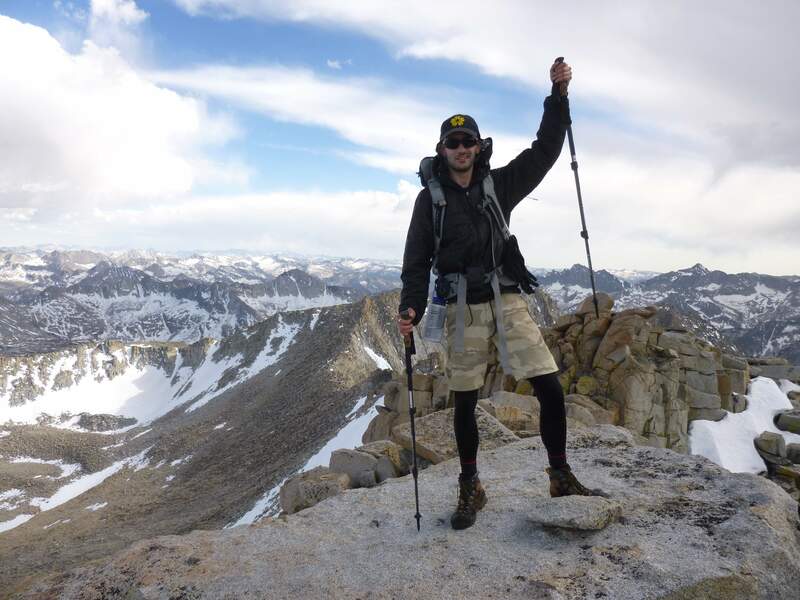 The summit of Mount Goode. Looking down the north face. Far below we could see the winding trail and many lakes we had passed earlier. Looking down at the Bishop Pass trail. After spending a good 40 minutes on the top, we quickly descended and began hiking north, back to our campsite. The afternoon weather held for us, and we enjoyed a lovely blue sky. Looking back at Mount Goode. At camp we celebrated a fantastic hike with a final pair of beers and a big dinner. We were treated to another wonderful sunset, and turned in for the night. 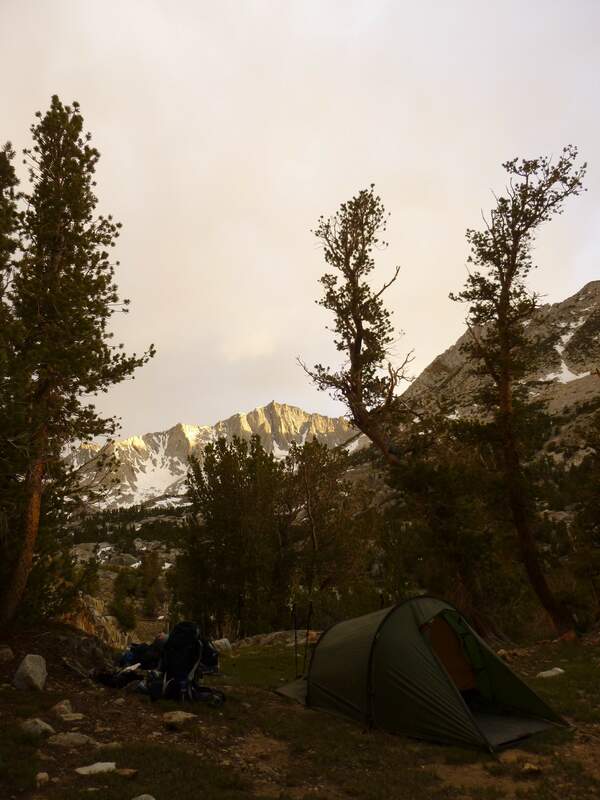 Day 3: After sleeping in we packed up camp and enjoyed an uneventful hike out to the South Lake trailhead, arriving before lunch time. 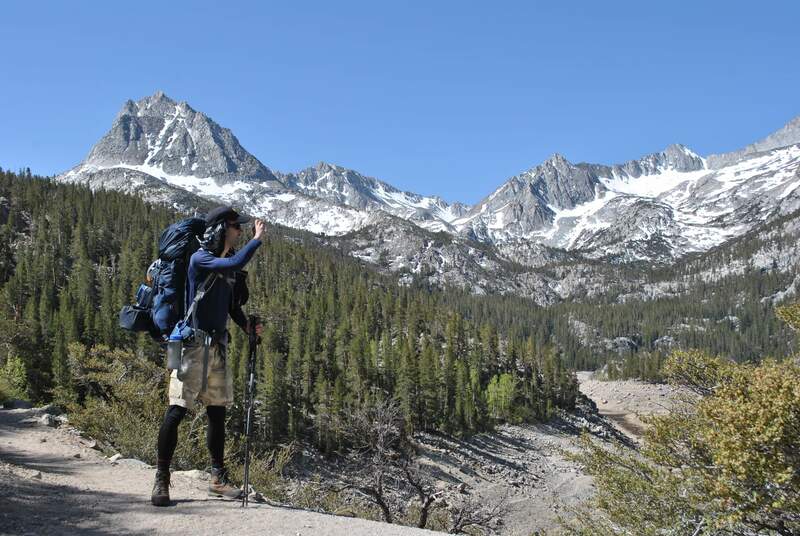 The Sierra Nevada is a beautiful wilderness, and it was wonderful to experience it firsthand. The hiking was scenic and covered some very enjoyable terrain, with plenty of opportunity for engaging scrambling. 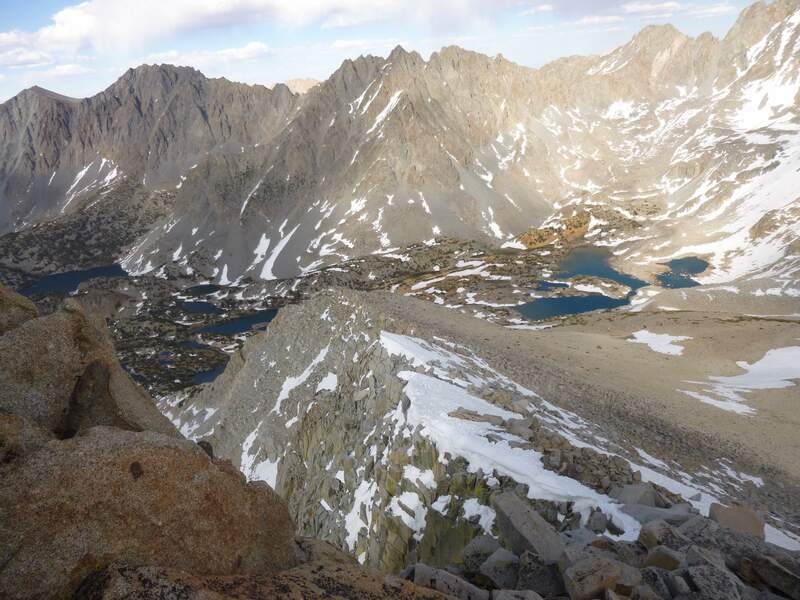 The Bishop Pass trail offers fantastic, compelling views of granite mountains the entire way in. I left with a strong desire to return, and definitely shall! 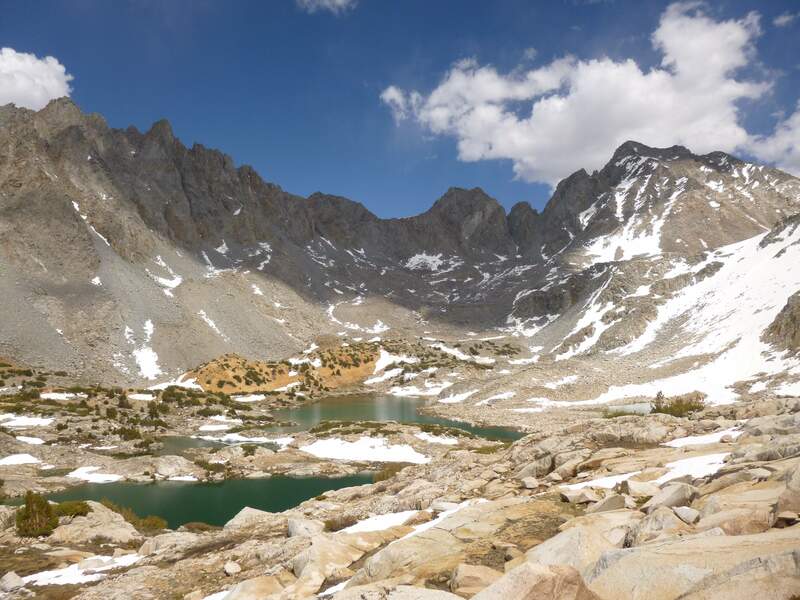 The Bishop Pass trail is accessible year round, although full winter weather mandates the use of snowshoes or skis due to heavy snow coverage. 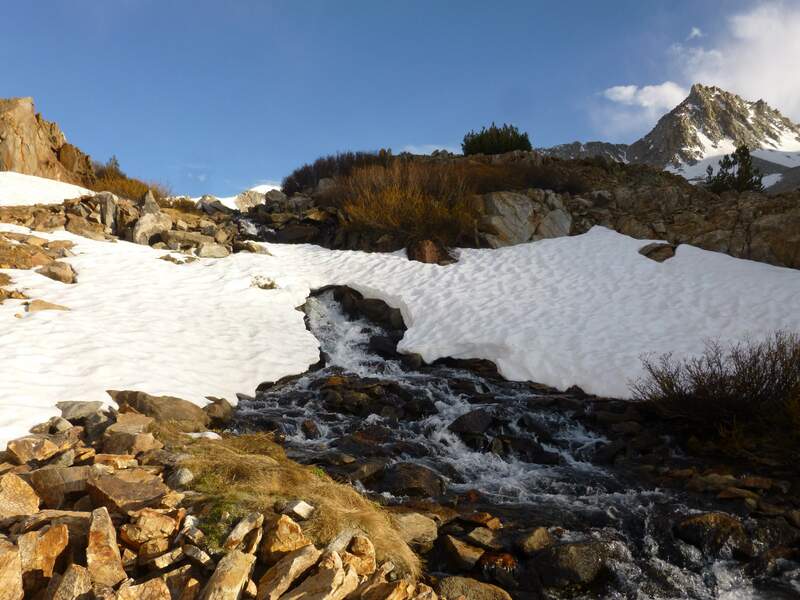 We brought ice axes and crampons, given our early season hiking, but had no need for them. 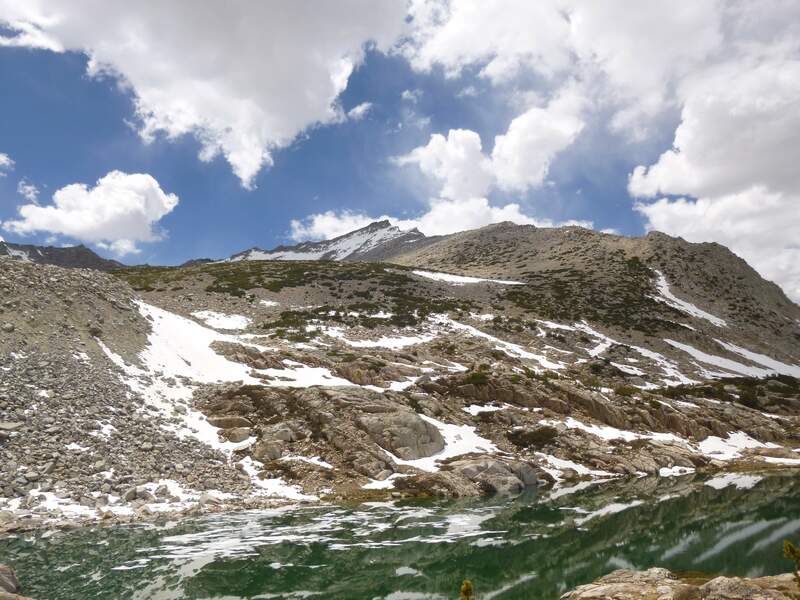 This entry was posted in Hiking, United States of America and tagged Bishop Pass, California, Cloudripper, Mount Goode, Sierra Nevada, South Lake by Ian. Bookmark the permalink.